Known as the “Immortal Health Elixir”, kombucha has been around for more than 2,000 years. With a rich history of health benefits and thought to prevent a number of diseases, it’s also a great way to support gut and intestinal repair, reduce inflammation and build healthy bacteria in the body. 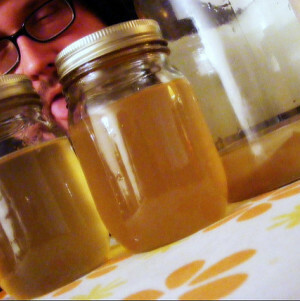 Kombucha is a healthy addition to any person’s diet. This is a crash course on kombucha, the fermented, probiotic beverage packed full of healthy bacteria, enzymes, vitamins and minerals. We will discuss why kombucha is a super smart beverage to be drink regularly and give you an overview of the ancient history of kombucha and then show you step-by-step how to brew it yourself along with some delicious samples of course! To help you get going right away you will be provided with a starter ‘scoby’ in a glass jar and easy instructions to take home. The featured image is borrowed and edited, with thanks, from Robert Anthony Provost under a Creative Commons licence.